It is an understatement to say that enterprise software is not known for being user-friendly. However, enterprise software user experiences may be getting a bad rap. According to a recent Capterra report, 71% of users really like their CRM. Frankly, I am not sure whether this is a good number, but when you compare it to other studies of the success of software implementations it seems like a very good number. According to Forrester, 49% of customer relationship management (CRM) project fail. Of course, we need to know what a failed CRM implementation project means. But even if that number is close,there is a big question here, "How can 71% of CRM users be happy with their CRM, but only half of CRM projects succeed?" There could be many answers to this question, and I would love to hear from you in the comments with your opinions or links to other studies, but it is a massively important question. I contend that the answer to this question lies in the difference between a successful implementation and actual end user experience. A project could fail because it took longer than expected, exceeded the budget, or otherwise did not get configured as planned. On the other hand, end users do not care about time and budgets. All end users care about is whether a new system is going to make their jobs better. So an organization could have a “failed” implementation, but happy users because the product is better than what people had before. Ensuring that enterprise software implementations are successful has never been more important as software eats the world. According to Statista, worldwide spending on enterprise software in 2014 was $314 billion. With this kind of money being spent, organizations should take the time to ensure software implementations are successful. Yes. Successful software implementations depend on the product being a right fit for the organization. The product must be integrated into existing systems and workflows of the organization. The product must also solve an important problem. These are all necessary conditions. But they are not sufficient. Unless people are addressed, successful software implementations will be an uphill battle. This is my claim, and there is some evidence to support it. 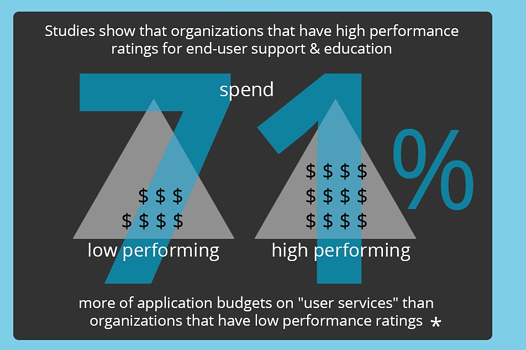 A recent Sandhill IT Adoption Insights survey found that projects that received high performance ratings spent 71% more if the overall budget on “user services.” In this study, user services is defined as end user support and education. To put this in more concrete terms, companies that have high performance ratings on projects, spend almost 12% of the entire technology implementation budget on end user support and training. The takeaway from this statement is that there is a certain level of investment an organization needs to address the “people” part of the implementation. You need to address support, change management, and training so people can understand why the new tool is being implemented, how to use it, and how to get support if they need it. Speaking of making sure your enterprise software implementation is successful, if your company runs on the Atlassian Suite (JIRA, Confluence, etc), you may be asking yourself, "Are we getting the most out of our investment?" This could be about understanding benchmark data and how your implementation compares, whether your JIRA instance is optimized for performance, or whether your instance is secure. If you have these questions, consider ServiceRocket's TrustedAdvisor product for the Atlassian Suite. TrustedAdvisor is more than just a check up. It is a prescription for long-term system health and optimization. How satisfied are your users with the enterprise software they use in your business? If you have run a successful software implementation, what actions did you take to make it successful? If you have been involved in a failed software implementation, what went wrong? What lessons did you learn?